The Alliance issued a statement after leadership meeting to discuss the latest political situation in Iraq and the institutionalization of the Alliance. The statement stressed that, in light of urgent need for a new political approach and a comprehensive national reform project beyond the sectarian, religious and ethnic frameworks, and in response to the requirements of the current phase that need a new methodology to manage the political scene, the Reform and Reconstruction Alliance comprised of the Sauruun Alliance, Al-Nasr Coalition, Al-Hikma National Movement List, Al-Wataniya Coalition, Al-Qarar Alliance, Turkmen Front List, representatives of the Christian, Sabean, Yazidi, and other factions, in which are 130 parliament seat, a desicion was made to institutionalize the Reform and Reconstruction Alliance, announced at the first session of the Iraqi Council of Representatives, and coinciding with the week of affection and compassion for the birth of the Prophet (PBUH). 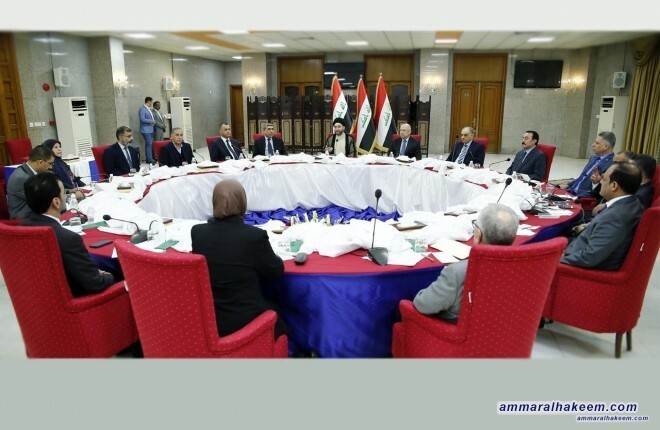 The meeting discussed topics on agenda, and foremost institutionalization of the alliance, as a first step towards the Alliance institutionalization building, his eminence Sayyid Ammar al-Hakim was unanimously elected as head of the Reform and Reconstruction Alliance.